As a small consolation for the money confiscated by Uncle Sam, Elzetta is giving away one of their Modular Flashlights of the winner’s choice on April 15th (Tax Day). Rhino Arms is handing out free entries into the Mammoth Sniper Challenge via a random drawing for you and a teammate. The Mammoth Sniper Challenge is a three day precision rifle competition from January 7-10, 2016 at the Rockcastle Shooting Center in Park City, Kentucky with targets out to 1,100 yards. Competitors must negotiate the Kentucky terrain and engage targets at up to 1,100 yards — it’s the real deal. Greenwood Village, CO – Double D Armory, LTD, the leading manufacturer of precision AR-15 rifles is partnering with Centennial Gun Club to give away a truly unique DDA, MODEL: SST, 9-11 Commemorative Rifle. The Commemorative Rifle will go to one lucky winner and 100% of the proceeds will go to support a great cause, “Hope For The Warriors”. When I found out about the non-profit, “Hope For The Warriors” and what they do to help our veterans who have sacrificed so much, I felt we had to do something. So, we went to work to create a one-of-a-kind custom patterned rifle. We wanted it to be something that would surely stand out, to honor those who have sacrificed for our freedom, and to give the winner something to be proud of. Our designer came up with something quite unique and incredibly awesome looking! — J. Delgado, CEO of Double D Armory, LTD. The Double D Armory, Model: SST AR-15 is a tribute to 9-11 and is a unique Commemorative, One-of-a-kind, Limited Edition Rifle. This drawing will be held on September 12, 2015 at Centennial Gun Club’s 2nd Annual Firearms Festival–an event you don’t want to miss! The winner doesn’t have to be present to win. “We are excited to team up with Double D Armory and “Hope for the Warriors” to remember and honor those who sacrificed so much, if not all, in the 9-11-01 terrorist attacks and those veterans who have also selflessly sacrificed. Jay builds a great rifle, it is our number 1 selling rifle at CGC, and the one-of-a-kind patriotic design for this giveaway is just awesome! We will announce the winner of this pro-America, commemorative gun at our 2nd annual Firearms Festival on September 12th. It will be fantastic to give a big check to Hope for the Warriors-who so competently and tirelessly help our veterans and their families.” — Paul Stanley, General Manager at Centennial Gun Club. “Hope For The Warriors” is a great charity that provides a tremendous amount of support to our war-fighters. They provide support in areas of Career Transition & Education, Clinical Health & Wellness plus an awesome Sports & Recreation program. “When Double D Armory contacted us and asked if we would like to be a part of this, we were all over it. For Double D Armory and Centennial Gun Club to come together like this speaks wonders about these two awesome organizations. This is going to be one event we can’t miss, and I personally will be flying out to be part of this. I really hope the community comes together on this and helps them reach their goal.” –Chris Sharon – Hope For The Warriors, Director, Outdoors Adventures. This is such a great cause and hopefully this fundraiser reaches it’s goal. With 100% of the proceeds going to “Hope For The Warriors”, it’s going to support a great charity. 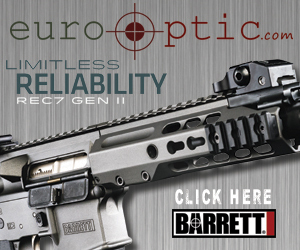 Entries for the drawing will be accepted beginning August 17, 2015 with the lucky winner of the rifle to be selected on September 12, 2015. The winner will be announced on both companies’ social media websites and the winner will also be notified by email. The lucky winner will win a SST Precision- Made Modern Sporting Rifle, finished in a Mil-Spec Hard Coat Anodized Camouflage Finish! This finish is unique! It is a Military Specification Type III Hard Coat Anodizing (not a paint or water transfer dip process). This unique finish is applied to last a lifetime! Double D Armory has been back-ordered since the introduction of our product and is nearly impossible to find at local dealers. Therefore, this giveaway offers an all the more unique opportunity for the lucky winner to obtain a highly sought-after firearm.